Fancy a film documenting the evolution of school lunch reform in Berkeley and there's not an interview with Alice Waters in sight. We'll get to that. First, some background: The Berkeley Unified School District's (BUSD) school food makeover and its much-lauded School Lunch Initiative has garnered lots of media coverage and is considered a stellar example for other public school district's struggling to bring fresh, healthy food into their cafeterias and classrooms. Students at Berkeley public schools get to learn first hand about cooking and gardening too. Given that, it's surprising it's taken so long for a documentary filmmaker or two to cover the school food revolution in this university town. Now comes Lunch Love Community, a series of mini-movies or webisodes, inspired by a New Yorker story on the "Renegade Lunch Lady" Ann Cooper. Cooper came in and overhauled Berkeley's central kitchen and school lunch menu, with a little help from Waters and her Chez Panisse Foundation. What documentarians Helen De Michiel and Sophie Constantinou quickly discovered, though, after spending time in Berkeley's public schools and steeping themselves in the history of the school food reform movement here, is that it takes a village -– not just a couple of school food rock stars -– to fix school food. "Alice Waters is a visionary, Ann Cooper is the general who mobilized the troops, Bonnie Christensen, the BUSD's executive chef, and Marni Posey, the district's Director of Nutrition Services, are in the trenches every day," explains De Michiel. "And they have taken this experiment to the next level, fined tuned it, and made it something sustainable that really works. That's the story we were interested in telling -- along with all the community members who came together before them to bring about change." Unhappy about the ubiquitous frozen tater tots, chicken nuggets, and canned fruit in heavy syrup trucked in from afar, a group of concerned parents worked for eight years on a Child Nutrition Advisory Committee to bring salad bars and fresh, local, made-from-scratch food into Berkeley schools. In 1999 the BUSD was the first district in the country to have a food policy -- recommending soda machine bans and wholesome over heavily processed foods. 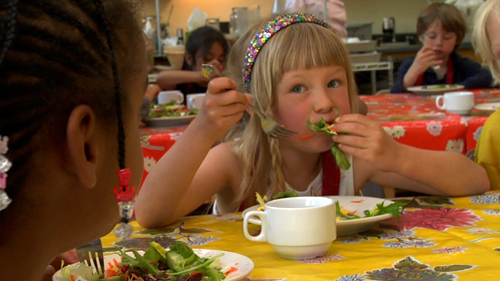 In light of recent developments on the school food front, the San Francisco-based filmmakers wanted to get their footage out as quickly as possible to a wide audience, particularly with the passage of the federal Healthy, Hunger-Free Kids Act. They also thought, frankly, that a digital distribution approach might help free up hard-to-come-by funding for a pending one-hour documentary project on the same subject. "We wanted to seize the moment, share what we found, and give people a way to respond to it and take away what was useful for them in their own communities," says Constantinou. "It's a key time in school lunch reform across the country." So they came up with the webisode concept, three-to-five minute pieces profiling different aspects of Berkeley's school food scene. The Parent Factor highlights the adults who banded together in the 1990s to change school food, including Eric Weaver, Beebo Turman, and Joy Moore. "Everything we put into our mouth’s isn’t food," explains Moore, who has worked on this issue for several decades and currently teaches cooking and gardening at Berkeley Technology Academy. "I want kids to know that and make smart choices for themselves. So I’m trying to raise the consciousness of all our children about food and health. My mission is really simple: it’s to get kids to value good food." The Labor of Lunch captures the time-consuming task of making from-scratch meals for 5,000 students every day. Flamin' Hot dishes up a funny take on teenagers' obsession for a certain kind of Cheetos. But Is It Replicable? addresses the question on many school administrators' and parents' minds. If They Cook It, They Will Eat It features Le Conte Elementary School cooking instructors Kathy Russell and Brenna Rich and their students illustrating what Waters has been quoted saying for years: Kids will consume vegetables -- even dark, leafy green ones -- if given the opportunity to grow, harvest, and cook themselves. And this: Food made with love tastes good. That's something that many of the district's devoted school and garden teachers have been sharing, organically, for years. The Whole World in a Small Seed focuses on Malcolm X Elementary's beloved school-under-the-sky run by Rivka Mason. "I'm a garden teacher and a body worker and I know just how important it is for students to get out of their heads and away from their desks so they can see, touch, taste, hear, and smell to learn; an edible garden is a perfect environment to do all those things," says Mason. "My mantra is: No child left inside. We've got so many kids sitting in front of screens for so long there's an epidemic of Nature Deficit Disorder. When kids get out and play in a school garden and pick produce and eat what they grow it's a wonderful, healthy thing. Here in Berkeley we have an entire generation of food-savvy kids who have grown up this way." Berkeley's school lunch program isn't perfect, as comments on this recent Berkeleyside story suggest. But Lunch Love Community is a timely reminder of the trailblazing role this community has played in laying the groundwork for the national school lunch reform movement now being espoused by the likes of First Lady Michelle Obama, Jamie Oliver, and the incognito middle American school teacher who writes the blog (and soon-to-be book) Fed Up With Lunch. Sunday, February 13, 2:30 p.m.